Their Lifetime of Sharing Continues . 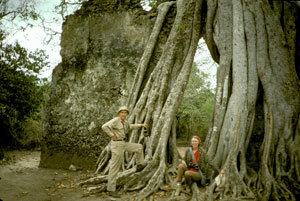 . .
Marian's and Dale's love and passion for wildlife started when they were children. Dale grew up in Michigan with parents that encouraged his curiosity in anything that struck his fancy. Marian was likewise fortunate to have parents that encouraged her interest in birds at her home in New Jersey. Their paths crossed at the University of Michigan where they both majored in botany. They married in 1950. Since then they have traveled the world together, seeking new flora and fauna on all the continents, their interests and curiosity always leading them to experience more of what the natural world had to offer. Marian and Dale chose to settle in Silver City because of its proximity to Mexico, the great habitat diversity within southern New Mexico and Arizona, as well as a job opportunity for Dale at WNMU. Marian wasn't idle while Dale was teaching. Besides raising their son Allan, she helped found the Southwestern New Mexico Audubon Society, the first in the state, and was also a founding member of the Gila Native Plant Society. 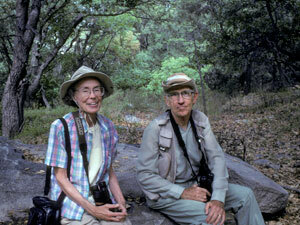 From the beginning, she was an active participant in Dale's birding and research projects, here and abroad. 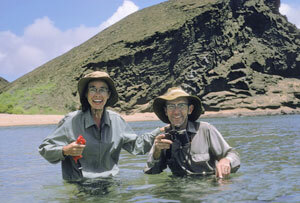 Marian and Dale both carried on the tradition their parents had started – encouraging and sharing interests in the natural world. With ever-increasing threats to wildlife and natural habitats, plus a growing need for nature education and research, Dale wants to ensure availability of resources for promoting greater appreciation of, and research on, native plants and animals. To this end, and to honor Marian's memory, he has created the Marian and Dale Zimmerman Wildlife Conservation Endowment to support appropriate studies and conservation in the American Southwest, particularly New Mexico. 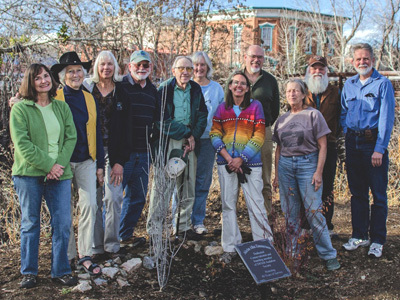 The Endowment has been established through Audubon New Mexico, and it is Dale's hope that others will make contributions. Contributions can be sent to Audubon New Mexico, c/o Karyn Stockdale, Randall Davey Audubon Center P.O. Box 9314, Santa Fe, NM, 87504. Be sure to include a note that your contribution is for the Zimmerman Conservation Endowment. 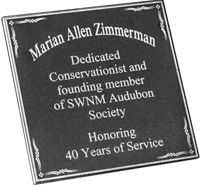 The Board of Directors of Southwestern New Mexico Audubon Society dedicated a plaque and memorial garden for Marian Zimmerman. The plantings include a Fragrant Ash Fraxinus cuspidata, (one of Marian's favorites) A Woods' Rose Rosa woodsii and a Columbine. Our thanks to the Silver City Visitors Center and Keller Suberkroop for making this possible. The Audubon Board of Directors at the Visitors Center. (L to R) Allison Boyd, Patricia Taber, Jackie Blurton, Dennis Lane. Dale Zimmerman, (Marian's husband,) Karen Beckenbach, Tricia Hurley, Brian Dolton, Nancy Kaminski, Elroy Limmer and Terry Timme. Not shown in photo, Sara Boyett and Lisa Fields.